... The Stûv 16 is fitted with a hinged door which only allows the fire to be refuelled. The Stûv operates only with the door closed. ... shape and style of the room. Available with a steel door in black or glass door in black or white. R SERIES - ideal for fireplace renovations. Gas or wood-burning fireplace with handmade majolica surround. Vertical see-through built-in fire. Double burner. Choice of log set, white Carrara pebbles, white or grey stones. Vertical built-in fire. Double burner. Choice of log set, white Carrara pebbles, white or grey stones. Very large see-through Fire. Multi burner technology. Choice of log set, white Carrara pebbles, white or grey stones. The closed fireplace is an architectural element consisting of a closed firebox or insert where combustion takes place, air intake and smoke removal system in an attractive package. It adds a decorative note to the room while heating various areas of the home. 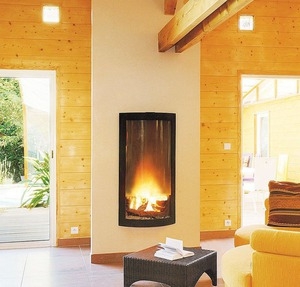 These fireplaces have a glass-ceramic door to separate the exterior cold air used to support combustion from the warmed air of the room, preventing heat loss. Their design favors circulation of the ambient air around the fireplace, heating it and redirecting it into areas to be heated. - Finish material (stone, wood, steel, marble, ceramic, etc. ).